And one of my themes in myPeking speech was about the rate of change in my lifetime, how it is accelerating and methods of learning to cope with the problems this causes. Whilst I don’t consider myself a caveman, there are times when the rapid rate of change happening everywhere I look does make me wonder if we, homo sapiens, are ready for it from an evolutionary standpoint. Let’s face it, the human body is not built to withstand travelling above a certain speed. We are soft flesh over a breakable skeleton. Yet here we are, able to buy and drive cars that can travel well in excess of that certain speed. Much of what we do, a caveman would recognise: we live in caves, albeit called houses and with air conditioning; we wear furs, although the clothes we wear come from mammoth stores, as opposed to a woolly mammoth; and we still eat nuts, berries, fruits and vegetables – although what Mrs Cro Magnon’s opinion of supermarkets would be, I dread to think. So we’re still doing all the same things the cavemen did, we’re just more sophisticated in how we go about it. We can devise changes in technology far faster than Mother Nature can in humans by evolution, so it’s no wonder the two are increasingly out of step. How has this rate of change affected our food? Posted: July 20th, 2011 under 5+ A Day, Food, Thoughtpieces. And by New Zealand visitor I don’t mean me! 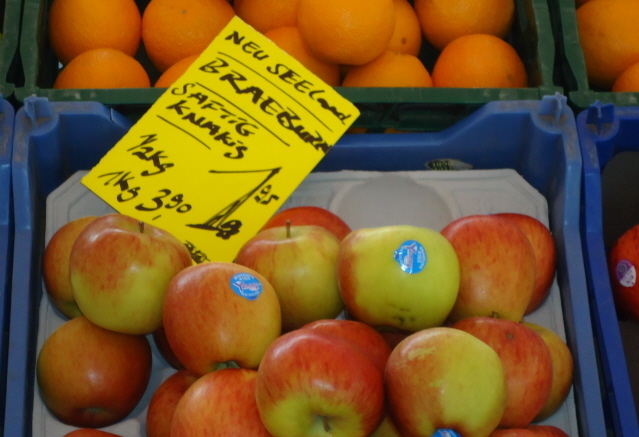 It’s great to see our apples here, and at such a good price. That’s Euros on that ticket, which roughly translates to NZ $6.80. If it moves at that price, that’s got to be good news for the grower. I have concerns about what I’m seeing here. Yummy is supposedly a premium brand. Is the size of the fruit, the shape, colour or skin markings seen in the photo above typical of a premium grade Braeburn? I think not. So what gives? I know John Paynter, founder and guardian of the brand, well enough to think that he would have concerns too. Can New Zealand really afford to be sending subpar fruit to one of its most important markets and hope to maintain good grower returns? I really hope your answer is the same as mine: NO. Posted: July 5th, 2011 under I went shopping today, On The Road Again, Produce. Germany has produced its fair share of philosophers over the years: Leibniz, Hegel, Kant and Heidegger to mention a few. 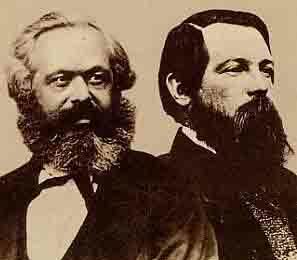 Even Karl Marx, whose Das Kapital in 1848 introduced the concept of Communism, fits into the line-up of German learned men. 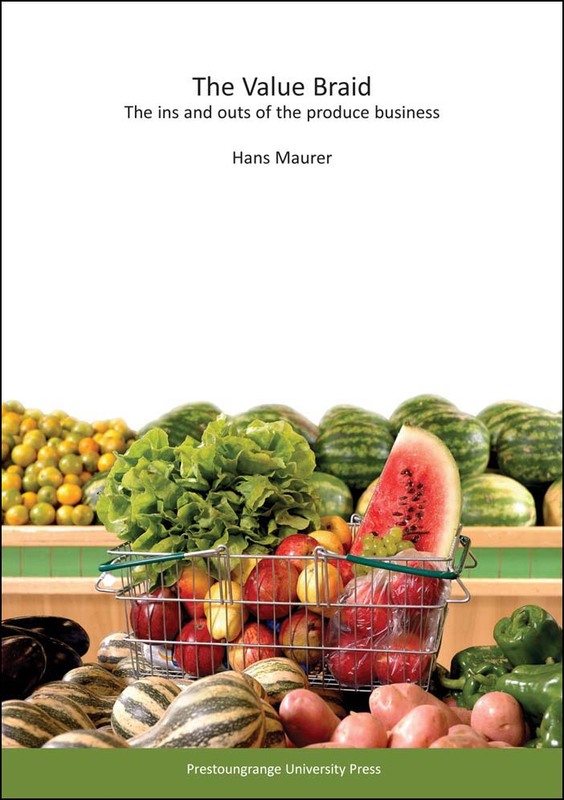 But on closer examination, one has to concede that acceptance of the concept that fresh food goes off is the single determining factor in why supermarkets manage their produce, meat, bakery and delicatessen departments differently from their grocery aisles. Regardless of which banner they belong to, retailers aim to sell as much of their fresh food at full price before it goes off. Posted: May 27th, 2010 under Thoughtpieces.